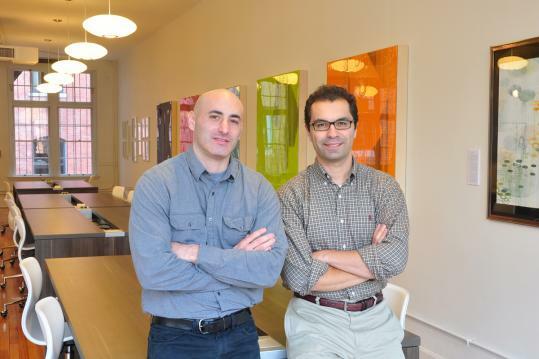 Oficio creators Charlie Weisman (left) and architect Nima Yadollahpour. Charlie Weisman’s office situation was less than ideal. Actually, it was non-existent. The founder of a New York arts organization, Weisman moved to Boston four months ago and spent most of his time working out of coffee shops. Great for the free wireless internet connection and endless caffeine, not so great for printing documents or holding client meetings. “A coffee shop has its positives and negatives, but if you’re trying to be professional, it just doesn’t work.’’ Enter local architect Nima Yadollahpour.